I can tell you the economic costs to Israel of leaving Gaza was 1,000 times the cost of staying in Gaza. The costs to the communities being struck by thousands of missiles, the costs of Iron Dome, the costs of the deaths many fold exceeds the costs of staying in Gaza,” he declared. At an address to the Conference of Major Jewish Organizations today, Minister of Economy Naftali Bennett was asked about the economic costs of staying in Judea and Samaria. In an unequivocal response, he explained why withdrawing from the region would cost Israel far more than remaining. “I’m a businessman! I can tell you the economic costs to Israel of leaving Gaza was 1,000 times the cost of staying in Gaza. The costs to the communities being struck by thousands of missiles, the costs of Iron Dome, the costs of the deaths many fold exceeds the costs of staying in Gaza,” he declared. 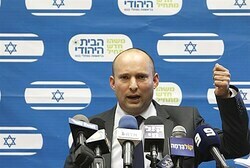 Bennett was clearly alluding to the fact that if Israel withdrew from Judea and Samaria, terrorists could fire rockets from the evacuated areas into Tel Aviv and that the after-costs of such a withdrawal would be catastrophic. Minister Bennett also emphasized that he is spearheading a program to “change the shape of the public relations battlefield” and emphasize not only Israel’s security interests in Judea and Samaria, but also the region’s status as the Biblical and spiritual bedrock to the Jewish people. “It’s our house. How can we occupy our own house?” he asked. Bennett also explained that the Iran deal on the table would allow Iran to keep the “enriching machine” that it has built over the past six years. With it, Iran could enrich enough uranium to produce a bomb’s worth of weapon-grade uranium every 6 weeks. This makes any deal which leaves the “machinery of 13,000 centrifuges” intact a very bad deal, Bennett said. He explained that even if Iran was stripped of all its current enriched uranium stocks, with its “enriching machine” it could easily develop nuclear weapons in a time of its own choosing when the world is focused on another crisis. Conference Executive Director Malcolm Hoenlein stated, “Minister Bennett represents a new Israeli leader that spans the divide between American and Israeli Jews. He is hi-tech and high Tanakh,” referring to the Minister’s success as both a hi-tech entrepreneur and an Israeli religious Jew. The briefing was well-attended and a great success.